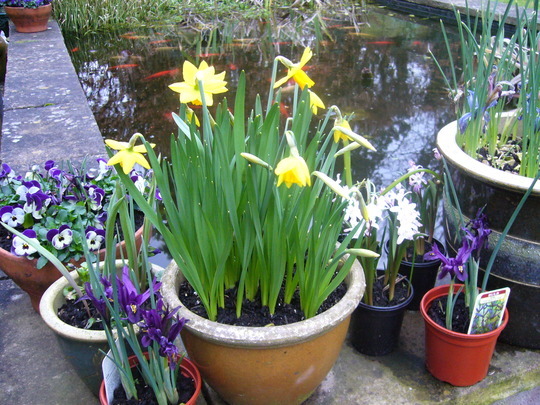 the corner of the pond where i keep moving pots as the flowers come and go. This looks nice Sbg.... the purples look lovely with the yellow daffs. I have to keep moving pots round. helps keep hubby on his toes and many will go ino the ground when they have finished flowering. There are over 40+ fish and they will breed again this spring. Spring has obviously arrived for you! Lovely collection of pots. See who else is growing Narcissus cyclamineus (Cyclamen-flowered daffodil).